Hotel is located in the old town, next to the cultural and historical sights. 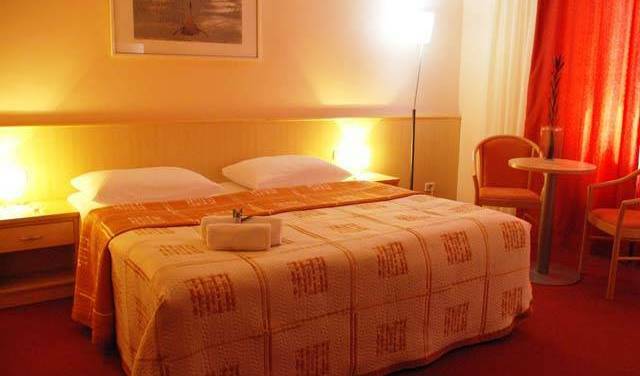 Smaller but comfortable rooms equipped with air-conditioning, anatomic mattress, luggage rack and an electronic safe. Features a modern-style interior, glass working desk, anatomical chair and extra club table with chairs, Biopur anatomic mattresses, elegant lighting and luxurious design patterns in Hotel Phoenix colours. 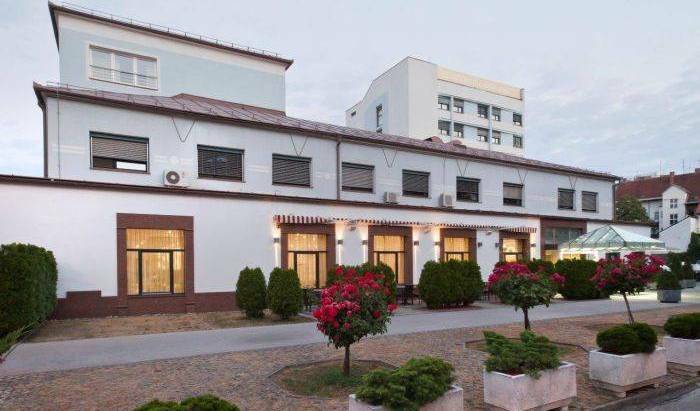 Other amenities: Individual air conditioning Electronic safe Luggage rack Electronic door locking system Smoke detector and SOS system Complimentary slippers and toiletries Breakfast: 10 euros per day per person. These comfortable rooms feature modern interior, an LCD satellite TV and a bathroom with a shower. Each comes with a glass work desk, Biopur anatomic mattresses, elegant lighting and luxurious design patterns in Hotel Phoenix colours. Other amenities: Individual air conditioning Electronic safe Luggage rack Electronic door locking system Smoke detector and SOS system Complimentary slippers and toiletries Breakfast: 10 euros per day per person. Decorated in a romantic theme, this room features a modern-style interior, glass working desk, anatomical chair and extra club table with chairs, Biopur anatomic mattresses, elegant lighting and luxurious design patterns in Hotel Phoenix colours. Other amenities: Individual air conditioning Electronic safe Luggage rack Electronic door locking system Smoke detector and SOS system Complimentary slippers, bathrobe and toiletries Guests staying in this room type have free access to the Wellness and Spa Area. Breakfast: 10 euros per day per person. Features a modern-style interior, glass working desk, anatomical chair and extra club table with chairs, Biopur anatomic mattresses, elegant lighting and luxurious design patterns in Hotel Phoenix colours. 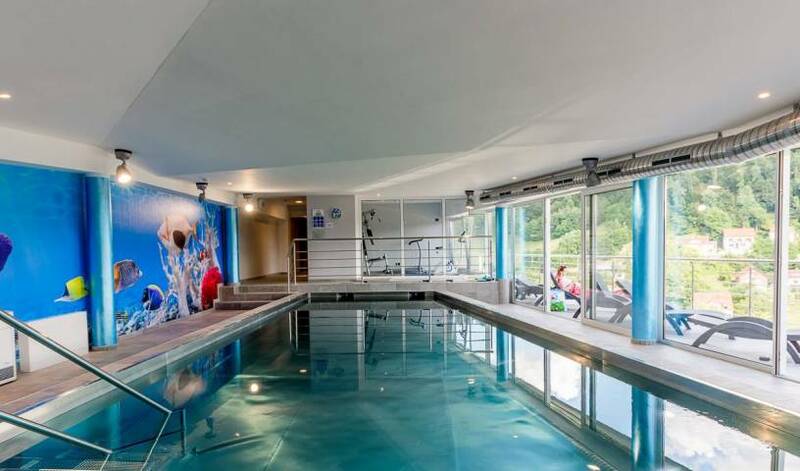 Other amenities: Individual air conditioning Electronic safe Luggage rack Electronic door locking system Smoke detector and SOS system Guests staying in this room type have free access to the Wellness and Spa Area. Breakfast: 10 euros per day per person. Main Square Hostel is located in the centre of Zagreb, just 20 metres from Ban Jelačić Square. The modern-style hostel offers beds in dormitory and en suite rooms with free WiFi access and a shared lounge. Sweet home, away from home! 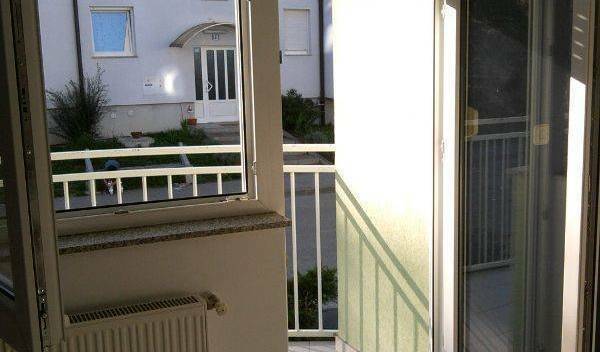 So you came in Croatia and you are looking for a nice and cosy place to stay in the centre of Zagreb. If so this is right place for you. Palmers Lodge Zagreb is part of award winning international chain of hostels! Luxury 75 m2 in the new center of Zagreb. Placed at the very neighbourhood of Zagreb Fair, less than 5 minutes from the main city entrance and freeway, 15 minutes from the old centre of the city and just 10 minutes walk The Museum of Contemporary Art, and also 10min to the largest shopping centres in Zagreb, Avenue mall and Arena. It's on the 9-th floor of the large building (Croatian version of the Unité d'Habitation of Nantes-Rezé designed by Le Corbusier), with amazing panoramic view, quiet and safe neighbourhood with no traffic (impasse) and literally leaning to the second largest city park in Zagreb, containing children playgrounds, enclosed dog park, and long walks for filling your lungs with a fresh oxygen. The building itself has 3 elevators, video surveillance on every corner and electric keys for entering the building, each of them uniquely associated to the specific person (apartment owner), so no unauthorized access is possible and each entry is recorded. 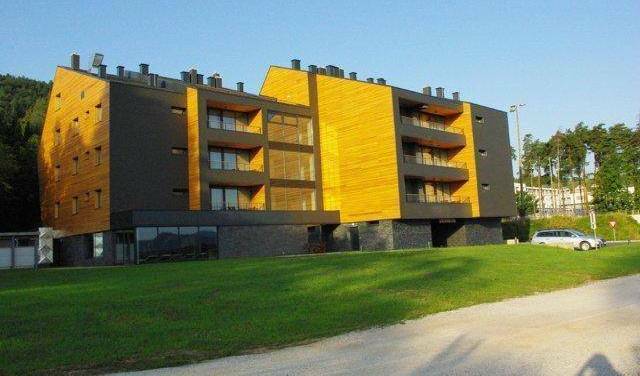 Jolena is a family apartment, consist of large living room with a modern kitchen, one single room, one king size bedroom, one large bathroom with a toilette, and one small separate toilette. Curiosity of the parents bedroom is that it has one small room attached to it, but separated with wooden-glass bulkhead. It's ideal for a small child that need to be close to parents, but still in his own room, without light or noise interference from the parents bedroom. Total accommodation capacity is 4+4 persons, but because settee sofa beds in the living room are 130x220cm in dimensions when flattened, we do not consider those as suitable for two adult persons, but are more than comfortable for 1 adult + 1 child, each. Those settee sofa beds are great and relaxant to sleep on because we have pure natural latex mattress toppers on them, so you'll feel like you slept in a real good quality bed. The apartment is equipped with a 110cm Internet LCD TV with multitude of international TV programs, air condition, DAF audio active monitor speakers system (you can play your favorite music from any smartphone, tablet, laptop, mp3 player etc and listen in the whole apartment- just be careful with loudness as speakers are real 80w power rated), central heating, unlimited fast free WI-FI, large fridge with a cold water tank, coffee machine, unique hand made and decorated dining table etc etc. You will not share the apartment with anyone during your stay, of course. Feel free to contact us on mobile or e-mail jolena. holidays, we speak English, Italian and Polish. It's not agency e-mail, we just like the sound of it :) Parking capacity in front of the building is practically unlimited, there is ALWAYS available parking space, free of charge all the time. Tram lines are 500m from the building. There is also large supermarket and the pharmacy in the building! The building and the apartment are 100% suitable for wheelchair access. There is literally not a signle stair from your parking place to the apartment. The largest of the 3 inside building elevators will take you from the garage floor directly to the apartment. That feature is also very convenient in case of bad weather. Driver can deliver the passengers and their lugage at the elevator doors, even park the car 3m away from the elevator (but for a short period of time) and afterwards move the car. Double bedroom with one additional bed with private (ensuite) bathroom, FREE satellite TV, WI-FI INTERNET, RADIO CD PLAYER, hairdryer, towels, free ironing, boiler for water (for coffee or tea), 24 hour security, air-conditioning, heating, FREE PARKING SPACE and FREE BIKE HIRE and FREE pizza delivery or other dishes! Double bed for two people. Single use also possible. Equipped with Minibar, Shower, Safety Deposit Box, TV, Telephone, Air Conditioning, Bathroom Amenities, Toilet, Bathroom, Heating, Satellite TV, Work Desk. Twin beds. Single use also possible. Extra bed possible . Equipped with Minibar, Shower, Safety Deposit Box, TV, Telephone, Air Conditioning, Bathroom Amenities, Toilet, Bathroom, Heating, Satellite TV, Work Desk. Self-contained room with terrace, double-bed, fridge, TV, bathroom with shower. Air-conditioner: +4,- EURO/day - optional, not included in the price. Tourist tax: +1, 5,- EURO/pers./day not included in the price. Studio apartment, one double-bed room, kitchenette (micro, fridge), bathroom with bathtub. TV, Wi-Fi internet, sunbathing terrace. Air-conditioner: +4,- EURO/day - optional, not included in the price. Tourist tax: +1, 5,- EURO/pers./day not included in the price. Self-contained room with terrace, double-bed and an extrabed, fridge, TV, bathroom with shower. Air-conditioner: +4,- EURO/day - optional, not included in the price. Tourist tax: +1, 5,- EURO/pers./day not included in the price. Family apartment with 3 rooms; two rooms with double-beds and a single bed, one room with a double-bed, kitchen (micro, fridge), one bathroom with a bathtub, one bathroom with a shower cabin, 106 cm Plazma TV, Wi-Fi internet, sunbathing terrace. Air-conditioner: +4,- EURO/day/room - optional, not included in the price. Tourist tax: +1, 5,- EURO/pers./day not included in the price. 2 separated beds, private bathroom with toilet and shower, free Wi-Fi. "The most beautiful hotel of 'Hungary in 2010"
The guests can choose between three different buildings, each one offering a different mood and style. The rooms of the Castle have an atmosphere of a bygone era, with genuine oak parquet, hand-carved furniture, which is unique in Hungary. On the hillside our Hunting Lodge is located, where tastefully decorated rooms and the Trophy room can be found which is ideal for small groups or family occasions. Our brand new Lily Wing building is equipped with beautiful bamboo floor, and the very modern wall heating & air condition system. Fitness & Wellness facilities are also to be found in this building. All of our rooms have tasteful fittings and rich equipment: air-condition, bathroom with tub or shower, towels, bathrobe, hairdryer, minibar, television, safe, WiFi internet free of charge serve the comfort of our Guests. The guests can choose between three different buildings, each one offering a different mood and style. The rooms of the Castle have an atmosphere of a bygone era, with genuine oak parquet, hand-carved furniture, which is unique in Hungary. Our brand new Lily Wing building is equipped with beautiful bamboo floor, and the very modern wall heating & air condition system. Fitness & Wellness facilities are also to be found in this building. 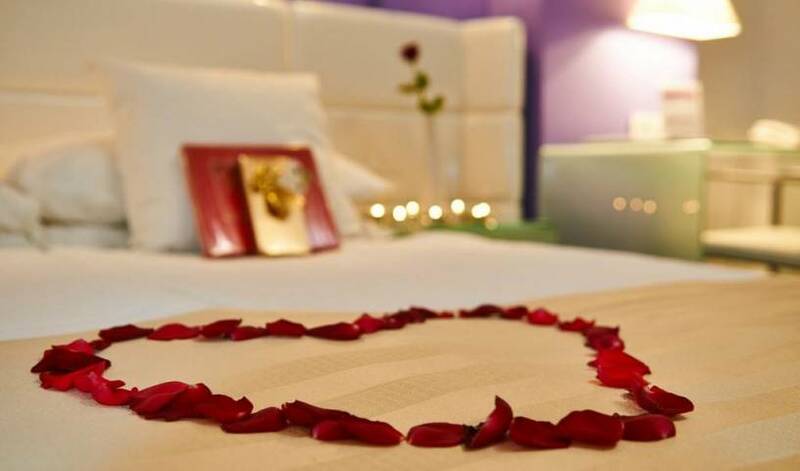 All of our rooms have tasteful fittings and rich equipment: air-condition, bathroom with tub or shower, towels, bathrobe, hairdryer, minibar, television, safe, WiFi internet free of charge serve the comfort of our Guests.